THE TRANSFIGURATION OF JESUS CHRIST! Jesus Christ is the Son of God in person! This makes him God in Person, too! "Truly this was the Son of God," when he saw the great earthquake of other great events at the end of the Crucifixion. Christianity is NOT just another religion! The page title above, comes from the New Testament book of Hebrews chapter 1. Jesus could not possibly be the "brightness of God's glory and express image of his person," without being, himself God! The Greek word, "character," underlying "express image," is used ONLY in this one place in the Bible. Blue Letter Bible cites the appropriate meaning for this word: "the exact expression (the image) of any person or thing, marked likeness, precise reproduction in every respect, i.e facsimile"
Innumerable details of Christ's, stature, bearing, supernatural abilities, character, etc., as seen in the New Testament, plainly witness to Jesus' genuine deity. The King correctly says, "God was manifest in flesh," modern versions wrongly, sadly, weaken this to an ambiguous pronoun. See my article God Was Manifest in Flesh. See also my article on Substitutionary Atonement because the vicarious atonement provided by Christ's innocent, sacrificial death is also unique to Christianity and it is absolutely indispensable for eternal salvation, with God. Perhaps as many as 300 Old Testament prophecies were fulfilled in Christ's life. 3When Herod the king had heard these things, he was troubled, and all Jerusalem with him. 4And when he had gathered all the chief priests and scribes of the people together, he demanded of them where Christ should be born. 6And thou Bethlehem, in the land of Juda, art not the least among the princes of Juda: for out of thee shall come a Governor, that shall rule my people Israel. Reading through the New Testament will locate many many other fulfilled prophesies. Here is an important testimony to the reliability of the Bible and Bible prophesy. Judeo - Christianity stands alone in some least 1500 years of archaeology and Old Testament Bible history going hand in hand. Particularly exciting has been the many Red-Sea-Crossing web sites showing impressive evidence to the truth of the bible account of the Exodus and Red Sea Crossing. A web search for "Red Sea Crossing" will find many more excellent sites. I want to comment that this research and sites seem be done by competent, motivated, buy non-professional-religious folks. There is a real war going on between the forces of good and evil. See my page on President Woodrow Wilson's words. Also my page Put on the Whole Armour of God. These findings on the Red Sea Crossing archaeology seem to have come to light in just the last 30-40 years. I am very very greatly persuaded that the professional religious leaders of this world DO NOT WANT this stunning evidence on the "Crossing" to come to light. It very powerfully confirms some of the greatest events in Judeo-Christian history, the Exodus, the Crossing, the giving of the Law on Mt Sinai, and many other important details. And I very much think that powerful world leaders are pushing Islam hard to compete very aggressively with Christianity. So, it is important we be conversant in the very powerful main points that distinguish Christianity from other religions. The Transfiguration of Christ up on the mountain is SO stunning! I include, here, the bible text plus commentaries from Wikipedia and from JFB. transfigured upon a mountain (the Mount of Transfiguration) (Matthew 17:1-9, Mark 9:2-8, Luke 9:28-36). Jesus became radiant, spoke with Moses and Elijah, and was called "Son" by a voice in the sky, assumed to be God the Father. It is one of the miracles of Jesus mentioned in the Gospels. This miracle is unique among others that appear in the Canonical gospels, in that the miracle happens to Jesus himself. Thomas Aquinas considered the Transfiguration "the greatest miracle" in that it complemented baptism and showed the perfection of life in Heaven. In addition to the principal account given in the Synoptic Gospels; Peter describes himself as an eyewitness "of his sovereign majesty." Second Epistle of Peter (2 Peter 1:16-18) and the Gospel of John may also briefly allude to the event (John 1:14). According to the Gospels, Peter, James, son of Zebedee and John the Apostle were with Jesus upon the mountain. The transfiguration put Jesus above Moses and Elijah. It also supports his identity as the Son of God. In keeping with the Messianic Secret, Jesus tells the witnesses not to tell others what they saw until he has risen on the third day after his death on the cross. In the narrative, after the voice speaks; Elijah and Moses disappear, then Jesus and the three apostles head back down the mountain, Jesus tells his apostles to keep the "vision" a secret until the "Son of Man" had risen from the dead. The apostles are described as questioning among themselves as to what Jesus meant by "risen from the dead" (Mark 9:9-10). Symbolic readings, as Martin Luther,take Moses and Elijah to represent the Law and the Prophets respectively, and their recognition of and conversation with Jesus symbolize how Jesus fulfils "the law and the prophets" (Matthew 5:17-19, see also Expounding of the Law). The presence of Moses and Elijah on the mount presents a problem for those churches and individuals who believe in "soul sleep" (Christian mortalism) until resurrection. Several commentators have noted that Jesus describes the transfiguration using the Greek word orama (Matthew 17:9), according to Thayer more often used for a supernatural "vision" than for real physical events, and concluded that Moses and Elijah were not truly there. Maximus the Confessor said that the senses of the apostles were likewise transfigured to enable them to perceive the true glory of Christ. 28. and eight days after these sayings—including the day on which this was spoken and that of the Transfiguration. Matthew and Mark say (Mt 17:1; Mr 9:2) "after six days," excluding these two days. 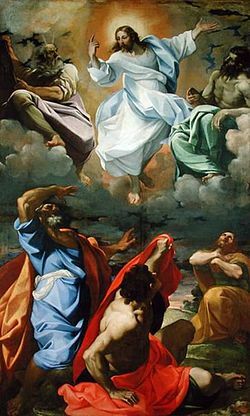 As the "sayings" so definitely connected with the transfiguration scene are those announcing His death—at which Peter and all the Twelve were so startled and scandalized—so this scene was designed to show to the eyes as well as the heart how glorious that death was in the view of Heaven. Peter, James, and John—partners before in secular business; now sole witnesses of the resurrection of Jairus' daughter (Mr 5:37), the transfiguration, and the agony in the garden (Mr 14:33). a mountain—not Tabor, according to long tradition, with which the facts ill comport, but some one near the lake. Consider Mine enemies, for they are many, and they hate Me with cruel hatred. Arise, O Lord, let not man prevail. Thou that dwellest between the cherubim, shine forth: Show Me a token for good: Father, glorify Thy name." of heaven upon earth, and their soul is made as the chariots of Amminadab. Their prayers fetch down such light, strength, holy gladness, as make their face to shine, putting a kind of celestial radiance upon it (2Co 3:18, with Ex 34:29-35). raiment white, &c.—Matthew says, "His face did shine as the sun" (Mt 17:2), and Mark says (Mr 9:3), "His raiment became shining, exceeding white as snow, so as no fuller on earth can white them" (Mr 9:3). The light, then, it would seem, shone not upon Him from without, but out of Him from within; He was all irradiated, was in one blaze of celestial glory. What a contrast to that "visage more marred than men, and His form than the sons of men!" (Isa 52:14). 30, 31. there talked with him two men … Moses and Elias … appeared in glory—"Who would have believed these were not angels had not their human names been subjoined?" [Bengel]. (Compare Ac 1:10; Mr 16:5). Moses represented "the law," Elijah "the prophets," and both together the whole testimony of the Old Testament Scriptures, and the Old Testament saints, to Christ; now not borne in a book, but by living men, not to a coming, but a come Messiah, visibly, for they "appeared," and audibly, for they "spake." of his decease—"departure"; beautiful euphemism (softened term) for death, which Peter, who witnessed the scene, uses to express his own expected death, and the use of which single term seems to have recalled the whole by a sudden rush of recollection, and occasioned that delightful allusion to this scene which we find in 2Pe 1:15-18.
which he should accomplish—"was to fulfil." at Jerusalem—Mark the historical character and local features which Christ's death assumed to these glorified men—as important as it is charming—and see on Lu 2:11. What now may be gathered from this statement? (1) That a dying Messiah is the great article of the true Jewish theology. For a long time the Church had fallen clean away from the faith of this article, and even from a preparedness to receive it. But here we have that jewel raked out of the dunghill of Jewish traditions, and by the true representatives of the Church of old made the one subject of talk with Christ Himself. (2) The adoring gratitude of glorified men for His undertaking to accomplish such a decease; their felt dependence upon it for the glory in which they appeared; their profound interest in the progress of it, their humble solaces and encouragements to go through with it; and their sense of its peerless and overwhelming glory. "Go, matchless, adored One, a Lamb to the slaughter! rejected of men, but chosen of God and precious; dishonored, abhorred, and soon to be slain by men, but worshipped by cherubim, ready to be greeted by all heaven. In virtue of that decease we are here; our all is suspended on it and wrapped up in it. Thine every step is watched by us with ineffable interest; and though it were too high an honor to us to be permitted to drop a word of cheer into that precious but now clouded spirit, yet, as the first-fruits of harvest; the very joy set before Him, we cannot choose but tell Him that what is the depth of shame to Him is covered with glory in the eyes of Heaven, that the Cross to Him is the Crown to us, that that 'decease' is all our salvation and all our desire." And who can doubt that such a scene did minister deep cheer to that spirit? It is said they "talked" not to Him, but "with Him"; and if they told Him how glorious His decease was, might He not fitly reply, "I know it, but your voice, as messengers from heaven come down to tell it Me, is music in Mine ears." 32. and when they were awake—so, certainly, the most commentators: but if we translate literally, it should be "but having kept awake" [Meyer, Alford]. Perhaps "having roused themselves up" [Olshausen] may come near enough to the literal sense; but from the word used we can gather no more than that they shook off their drowsiness. It was night, and the Lord seems to have spent the whole night on the mountain (Lu 9:37). saw his glory, &c.—The emphasis lies on "saw," qualifying them to become "eye-witnesses of His majesty" (2Pe 1:16). 33. they departed—Ah! bright manifestations in this vale of tears are always "departing" manifestations. 34, 35. a cloud—not one of our watery clouds, but the Shekinah-cloud (see on Mt 23:39), the pavilion of the manifested presence of God with His people, what Peter calls "the excellent" of "magnificent glory" (2Pe 1:17). a voice—"such a voice," says Peter emphatically; "and this voice [he adds] we heard, when we were with Him in the holy mount" (2Pe 1:17, 18). 35. my beloved Son … hear him—reverentially, implicitly, alone. 36. Jesus was found alone—Moses and Elias are gone. Their work is done, and they have disappeared from the scene, feeling no doubt with their fellow servant the Baptist, "He must increase, but I must decrease." The cloud too is gone, and the naked majestic Christ, braced in spirit, and enshrined in the reverent affection of His disciples, is left—to suffer! kept it close—feeling, for once at least, that such things were unmeet as yet for the general gaze.